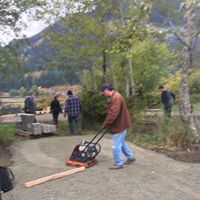 In the fall of 2016, the Rotary Club of Pemberton's LOCAL project chair, Phill Read, began the planning process with the Village of Pemberton. The Rotary Club secured funding, donations and local sourced resources to complete this project. Work began in June 2017. The old boardwalk was re-built and now contours around the outcrop adjacent to the lake. Parts of the dock were used to provide a large swimming area away from the trail. In addition, a new floating dock was positioned off shore for additional dock space. The Interact Club of Pemberton and other 2017 Grad Students were instrumental in getting the materials to the site. In the fall of 2017 as the lake level dropped, with permits in hand and a steady stream of volunteers helping out, the Dog Beach was great expanded and enhanced. Material was hauled by CME, Sabre and CSJackson. The Village of Pemberton and Pemberton Valley Dyking District offered excavator time to move sand and gravel. Many volunteers came up to rake, build fences and benches, and spruce up the entire area. We have heard from many folks that they enjoy both the new TEEN DOCK and the upgraded DOG BEACH.